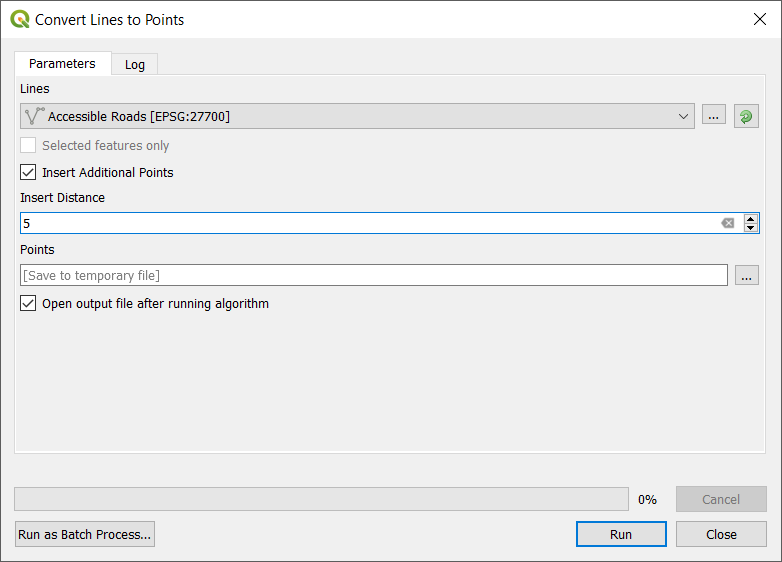 Using QGIS example Fibre to the Home (FTTH) networks were created using open source data from OpenStreetMap (OSM) and free samples of Ordnance Survey (OS) AddressBase data. Due to the availability of sample (free) OS AddressBase data being in Exeter, the city centre was used in all examples. In both web maps buildings and road lines are used, both of which can be extracted from the OSM data file downloaded from the OpenStreetMap.org site, to be found in the downloaded map.osm file of the area selected in OSM. For clarity, buildings data was extracted from the OSM data, using the Filter: “building” is not null. Roads too were extracted and filtered from the file map.osm, using only the classes, residential, secondary, tertiary, tracks, service roads and unclassified roads for road line connections. The SAGA Feature Extents tool applied to the Exeter Buildings layer was used to create the study area, and in turn used to Clip the Accessible Roads and AddressBase layers. The first web map linked Building Centroids (a close approximation to AddressBase data) to points at road junctions (in a layer called Road Junction Hubs). The second web map linked AddressBase data to points on roads spread evenly along roads, typically to the front or rear of buildings. 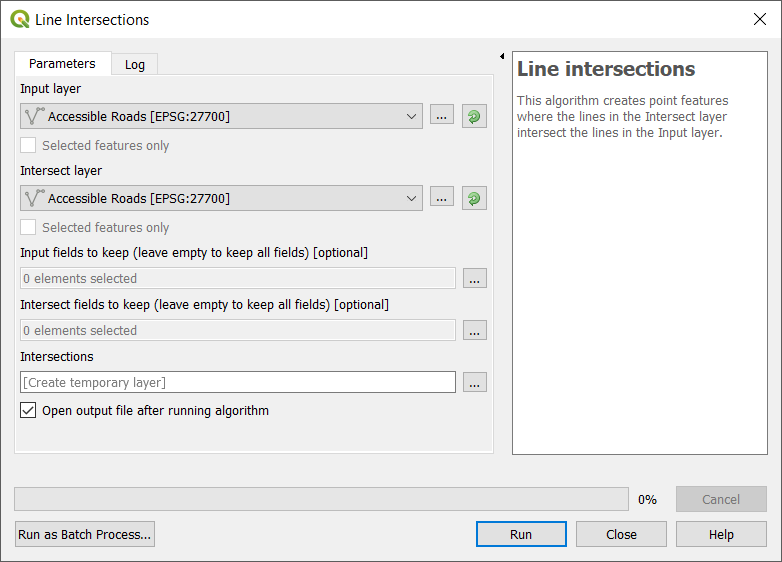 Road Junction Hubs were located using the QGIS Line intersections tool, using the layer Accessible Roads as both the Input layer and Intersect layer. The House2Hub connections were created using the QGIS Distance to nearest hub (line to hub) tool, selecting Road_Junction_hubs as the Destination hubs layer and the Hub layer name attribute set to ‘highway‘. Conclusion: This network scheme implies aerial connections linking homes and buildings to poles at nearby street corners or road junctions. This clearly is not a viable solution, though it would in places remove the need to dig trenches in roads where cable ducts do not already exist. The second approach routes fibre from buildings to ducts in adjacent roads. Splices located in duct covers along road lines, spaced at 5m intervals. In the example AddressBase data was used instead of building centroids, though points do not sit neatly in building polygons. Road lines were split using the SAGA Lines to points tool. The processed layer used was Accessible roads, with the split set at 5m intervals. 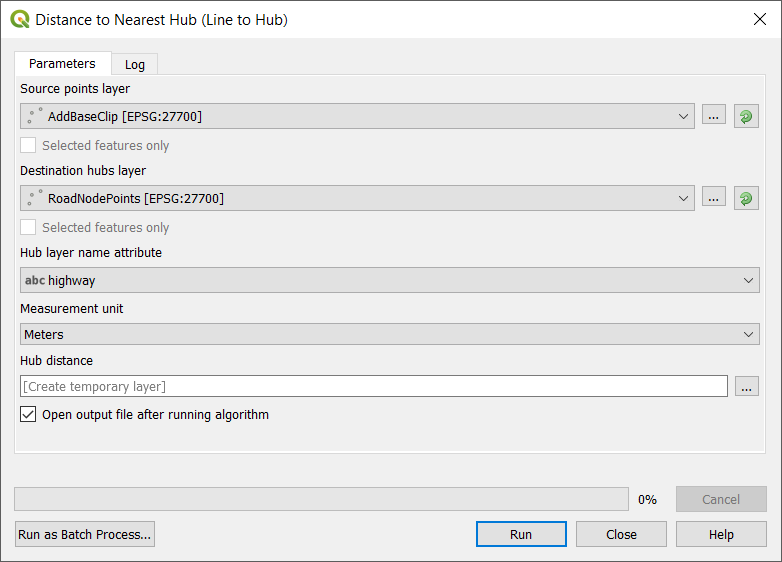 As in the previous example, House2Hub connections were created using the QGIS Distance to nearest hub (line to hub) tool, selecting the Destination hub layer as Road Hub Splices and the Hub layer name attribute set to ‘highway‘. This produced a more conventional fibre layout, routing cables from buildings to the nearest Road Hub Splice, though again it described a scheme rather than an actual route the cable would take. Again using the Line Intersection tool those road splice points that were not used, were removed by choosing only the points that were intersected by House2Hub lines, though it can be seen that QGIS omitted some of the House2Hub connections. Conclusion: Using a basic set of tools QGIS provided an almost useable plan from which to design a cable network. There were anomalies in the road splices selected, and several splices carried two or more cables. More work would have to be done to establish optimised plans for major hubs, including the analysis of fibre lengths required. In the examples data is projected with the OSGB 1936 / BNG coordinate reference system.